PARTZ INDEX CHARM INDEX Minimum Order $30. OR.... how to attach, cover, refinish, inlay, join, seal, color and otherwise alter almost anything. No surface is immune to our creative muse! Cold joints, mechanical wraps, collags with paper, metal, fabric and glass, solving structural problems.... We are raiding our archives, reviewing years of notes the goal: publishing our unique processes as guides, e-books, tutorials & specialty goodies. 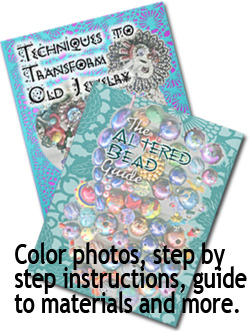 Altered Beads Guide Give those leftover beads a facelift! Use common household items and inexpensive materials to create a fabulous effect! Secrets of Making Pins/Pendants from Broken Jewelry techniques to "finish off" broken bits, mask stained finishes, disguise missing stones, and much more! 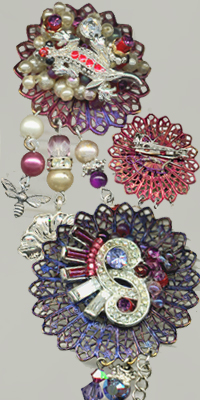 Flapper-Style CD Handbag Make a Retro-Style Handbag from 2 CDs using tube beads, charms, wire and your imagination! Wild Wonderful Wired Women! Beads of different shapes and sizes, combined with wire and creativity are all the ingredients you need for this fabulous party favorite! How to Make Paper Beads. Although the PDF covers using our designer papers, you can use any type of paper that will absorb liquids. This can be adapted for any age, even toddlers using non-toxic white glue. How to Make Fancy Wire-Wrapped Earrings Combine pieces of colored wire with seed beads, freshwater pearls any small charms with the fun wire twisting, to make a light, airy, swirly and unique pair of earrings that are unforgettable. Give Your Leftover Beads a Makeover! 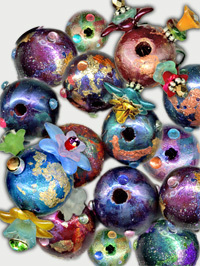 Transform those thrift shop or yard sale beads into original works of art! 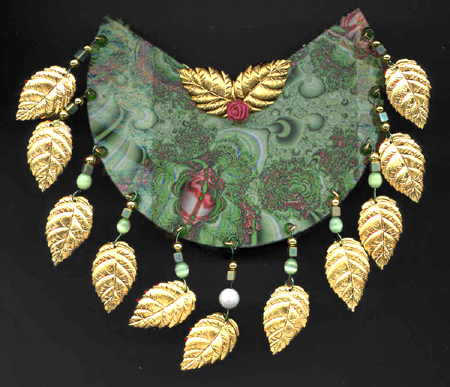 Use wood, plastic, metal, resin, bone beads, inexpensive colorants, add ribbon, fiber, foil, rhinestones, and more to get beads uniquely yours. Our Altered Bead Guide lists eight different techniques that you can combine to get dozens of effects! Time to reuse and recycle! Learn a variety of techniques to "finish off" broken bits, mask stained finishes, disguise missing stones. Covers techniques for joining materials (mechanical joints), chemically stable paints, faux metal treatments, adhesives and finishes. Use techniques to create unique gift items. Instructions contain a template for drilling your CDs and a template for making the liner and a discount coupon for charms from NotJustPartz. 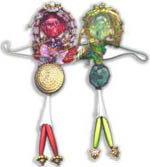 Sporting free-swinging bugle bead bead hair anchored on a glass bead head, arms outstretched to grasp the world, and a skirt reminiscent of Olive Oyl (with bead legs & feet showing), this "wired woman" can be worn as a pin or displayed on a desk with pride. Step by step instructions show you how to make this delightful "wired" woman, what kinds of beads you'll need, and alternate techniques to use when you want to make a change. Directions make it easy to size create your finished product to suit your needs. Fairly easy for those used to beading and working with wire. Wire cutters and round nosed pliers necessary. A discount coupon for purchasing items from NotJustPartz included.